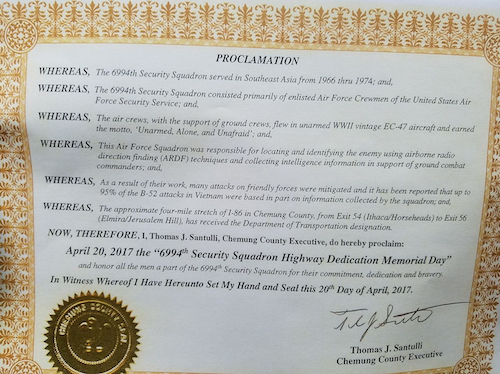 On Thursday, 20 April 2017, a four-mile stretch of I-86 in Chemung County, NY was officially designated as the “6994th Security Squadron Memorial Highway." The designation ceremony took place at the Wings of Eagles Discovery Center in Horseheads. Pictured here is the official proclamation - click here for a larger view. The ceremony follows the 2016 enactment of a new law (S5582/A9664, Chapter 366 of the Laws of 2016) sponsored by State Senator Tom O’Mara (R,C,I-Big Flats) and Assemblyman Chris Friend (R,C,I-Big Flats) at the request of Joseph Giammichele of Horseheads, who served with the 6994th and is currently one of its alumni officers. Giammichele said, “The members of the unit were very skilled and willing to do what was necessary to complete the mission. As a result, more Distinguished Flying Crosses (DFCs) were received by members of the unit than other Air Force units serving in Vietnam. Numerous members of the unit voluntarily served more than one tour of duty in Vietnam." Read more about the Squadron on their website at: www.6994th.com.